A few months have passed since Susan`s ordeal in the museum, and she`s been in no hurry to greet danger again. But when a prized notebook arrives at her office from an anonymous source, both her interest, and her suspicions are raised. The information contained within is too valuable to ignore. Soon she`s off traveling the world, solving puzzles and tracking down mysterious clues in search of the most renown treasures of history and legend. 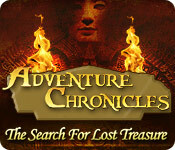 Adventure Chronicles: The Search for Lost Treasures is rated 3.3 out of 5 by 25. Rated 5 out of 5 by mcgillican from Museum adventure continues A nice little sequel to the Escape the Museum games. This time, no earthquake to start things off. It is an adventure to find various valuables from history to ADD to the museum. The hidden objects can be very difficult to see - but that IS the point, right? And, you have an option to return to see if you can find even more items once a scene is cleared. The music is a little annoying, so I podded that way down. The voice over is good and the story is interesting (IMO). The graphics are not as sharp as could be, but still, not that bad, either. Overall, I like the game a lot. No going back and forth to find a single item. The scene is the only place you need to be. The riddles can give your brain cells a tug but they are not impossible. The geocache has a riddle and the journal has another set of tip style riddles. Not a dark game at all so if you like creepy dark, this is not the game for you. This IS a nice little break from all the darkness. Rated 5 out of 5 by Dr_Q from My kind of game Yeah, it's dated, and some of the scenes are too dark, so you have to use the hints to find some of the items, but overall, it has everything I'm looking for in a game. No HOS junk piles. A few tools that are used throughout the game, and some items that are found and used in specific scenes. No back tracking. A variety of different locations, where the setting and the items (for the most part) fit the theme. A storyline that is pretty straightforward and does not involve rescuing grandpa from the supernatural. Puzzles that can be solved using logic and perseverance, and none of them repeat. I also appreciated the chapters, so that I could finish one, then get back to my real life, and pick it up again without having to try to remember where I was. Rated 5 out of 5 by OldLady12 from Super Great Game! Bought this a while back and just played again. 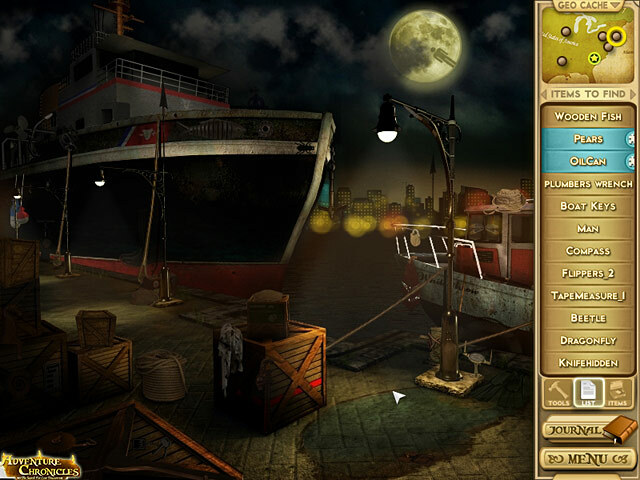 It is a super hidden object game and you can learn some things about the past, too. You travel to different locations to find the "great treasures". The scenes are sometimes a challenge as all objects are well hidden. There are also helps as in you may need to dig, brush, burn or break open things to find the object you need. You also need to find the "geocache" object that will be displayed in the museum. To find out what object this is, you click the down arrow at the upper right side of the screen and a riddle and/or description to solve will give you a clue as to what to find. After all the scenes are finished in one area, you can go back and there is a bonus round of objects to find. This is a great game for children & adults. Rated 5 out of 5 by baba247 from I Loved this I bought this back in 2008 and I loved it, it wasn't long after I bought it that it was in the top 10 or something like that. It has a great story line to it and the graphics, colours, are awsome. I loved that it was in the time of Pharou ( sorry spelling ) anyway back than. This game was one of the ones that I learned and got hooked on Hidden Object games. Once I was able to buy it and finish it I was so hooked and the rest is history, so play it even now you who are experinced you will enjoy this. 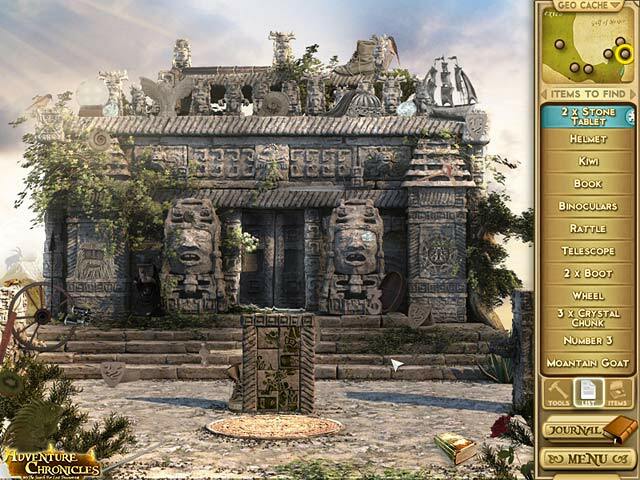 Rated 4 out of 5 by arnold1049 from ENGAGING FUNDAMENTAL HIDDEN OBJECT GAME The storyline for this game is the seeking of different treasures related to a certain event in history and the place where this event occurred. I played the full hour of the demo. In the hour of the demo, I was looking for a treasure related to the American Civil War. There were 5 (I think) locations that needed to be searched for the treasure. I was unable to complete this search so I did not find the treasure. Each location had a list of items to find in the scene. Some of them were very small and others really faded into the background, so they were challenging. There were also some interactive items where I had to take additional steps in order to find the object. Another item, not listed, had to be found to take you closer to the treasure. Nowhere was there any information to tell me what the item was. So I needed to randomly click on the items in the scene until I found it. At one location, I never did find it but spent a lot of time looking, causing me to run out of time before I could finish the "chapter". Moving between locations was simple with the use of a map. If I was having a problem with one location, I could move on to another; I did not have to finish one location before moving on. When I did return to a location, for instance to look for that "extra" item that I had been unable to find previously, I was presented with another, different list of objects to find in the same scene. That definitely added interest and variety to the game. Since I didn't find the Civil War treasure, I have to guess that the rest of the game would be made up of the search for more treasures, resulting in 4-5 or more locations for each treasure to do the Hidden Object search. Since there were several treasures, I would think this game would be fairly long. It was challenging and had a lot of HOS, which I like. The graphics were good. The sound was irritating so I turned it off, as I usually do with all games. I was interested enough about what other treasures and locations would be available and wanted to go back to try to find the special item I missed that I immediately purchased the game. I don't think I will be disappointed. Rated 4 out of 5 by gamefan10 from Very interesting game I liked this game a lot. There were a few problems, but overall it was lots of fun to play. The museum director gets clues from a mysterious man who directs her to hidden historical treasures as well as piles of gold. The director is suspicious of this man but continues to follow his clues. Each location has several sites where you look for hidden objects. There is also a hidden geocache, which is described when you click on the geocache button. You have some tools to help you. There is the item finder, which is like a Geiger counter that glows when you get closer. There is also a hammer that you can use to break boxes and jars. A lighter helps you to burn away bushes that are hiding objects. And a brush gets rid of dust so you can see what is underneath. At times you find other items that can be used to find all the hidden objects. 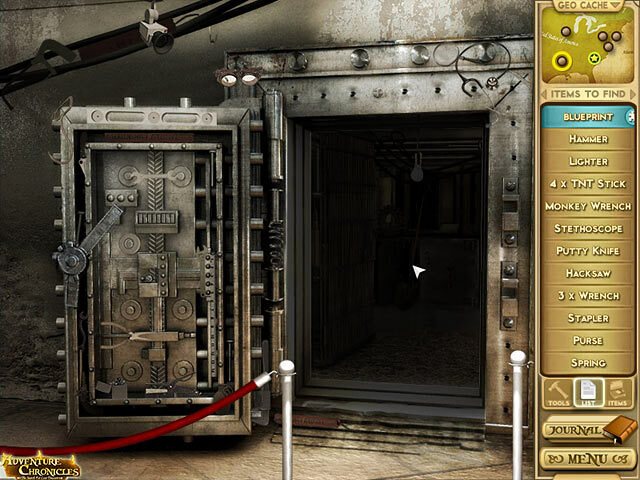 Once you finish a location you can go back and do a search for additional hidden objects in each of the areas. I liked the story on which the game is based, and enjoyed hunting for all the hidden objects. The reason I didn't give this game 5 stars is that some of the objects were totally impossible to find, sometimes due to a dark screen or background of the same color, and sometimes due to a very small size. There also was no hint button, and there were a few times when I just couldn't figure out what to do. I had to leave the game and check the forum for suggestions. In spite of these difficulties, I definitely enjoyed playing the game, learning what happens in the story, and would recommend it. Rated 4 out of 5 by pennmom36 from I Got Lost In my opinion there were a lot of items that were impossible to find, and I never could figure out how the item finder worked. It was however a really nice hidden object game with a side of adventure. Your goal is to find out if a treasure really exists or if the letter somebody sent you is a hoax. If real, the Civil War treasures would be an awesome addition to your museum. You will search library's and even the Empire State Building for clues. Some items you find will be kept in your toolbox to help you throughout the game, such as brushes and hammers. I would have loved this game if the items were a tad bit more recognizable, some items were just too small. Rated 4 out of 5 by lizhger from Did not purchase, too dark If only the scenes had been a little lighter I would have purchased it. I liked the game, I like to solve things without much help but when you can't see the scene...it was going to be a headache. I deleted it after the hour trial.